It’s dark, pitch-black actually, except for the dim spotlights our headlamps create. We are in a race against time – against the sun. We want to reach Uhuru Peak, the tallest point in Africa at 5,895m, before the sun does. We are exhausted –I’m exhausted– and we still have to climb over 1,100m in the darkness of the night, in less than seven hours. This will be the longest night of my life. 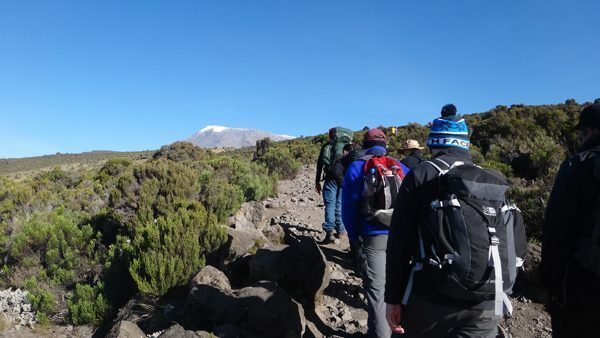 As an avid backpacker and adventure seeker, hiking Mount Kilimanjaro has been a dream of mine for quite a long time. 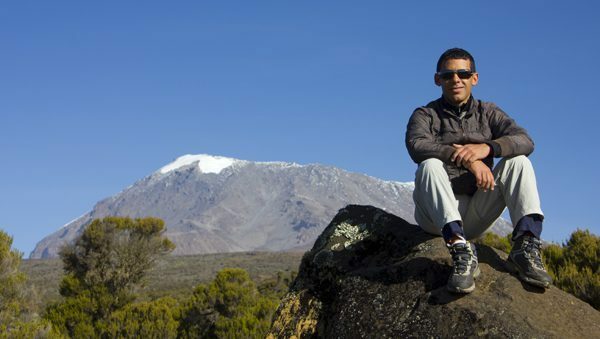 I like to challenge myself and push my limits, and Kilimanjaro seems like the right challenge for me now. 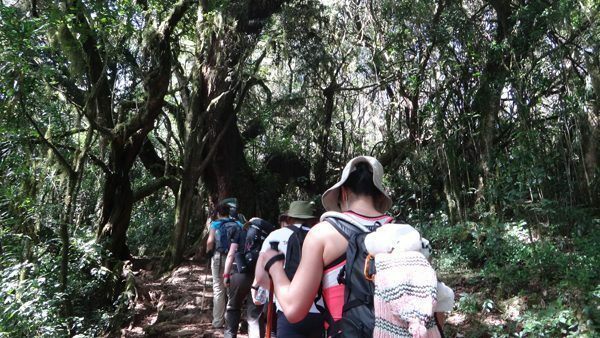 For my hike, I decided to do the Marangu Route with G Adventures. They are not the cheapest tour company, true, but I’ve traveled with them before a few times, so I know the type of quality I get from this kind of trips. And believe me, on hikes like this, a good tour company makes a significant difference. I’ve been traveling through Africa for a few weeks by now, so I reach Moshi –the base point to start the Kili hike– on my own after a seven hours bus from Nairobi. There I meet with the other hikers who I’ll be joining on the hike. We make our introductions, talk about the hike, and get a good night rest… the last one for the next five days. Tomorrow, the strenuous hike begins. 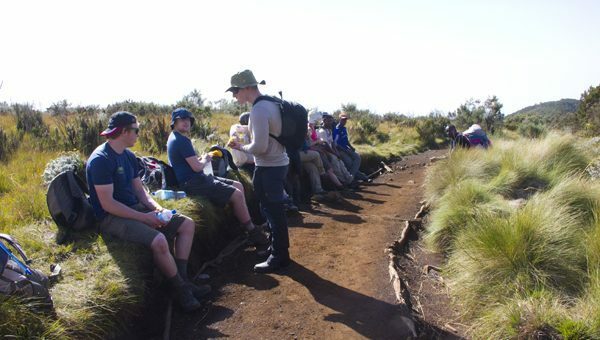 At 8:00 am we part from Moshi, by bus, and head to Marangu Gate – where we officially start our hike, at 1,840m. The hike starts slow, too slow. This is not even a leisure pace; this is the pace of someone sentenced to death, dreading his unavoidable fate. There are a few reasons behind this pace: to prevent sweating, conserve energy, and better acclimatization. All imperative to take seriously if I want to reach the top. We walk pole pole, slowly slowly. For the first few hours, we walk surrounded by a green, lush rainforest. Tall trees give cover from the sun and monkeys make their intriguing appearances now and then. 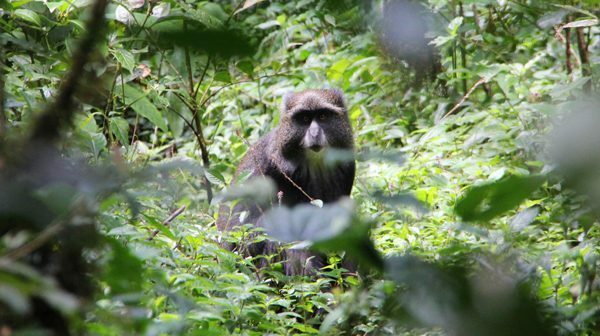 From what I can see, other than the monkeys and a few small animals, there’s not much wildlife in Kilimanjaro. I’m hiking with a group of interesting people from all over the world. Along the way, we walk and talk – there’s nothing else to do than walk and talk. I share travel stories with Matt and Ryan; discuss random topics with Hugh, Dave, Neil, and Vik; and play games with Laura, Yanny, Avi, and Susan. As we make our ascent, we can clearly see the change in our environment. The trees now don’t look much like warm weather forest trees, they are slowly morphing into cold weather pines, and they are less dense and shorter than the former. We get to Maranda Hut, our campsite located at 2,720m. Dave, Hugh, Neil, and I become roommates – and very cool roommates they are! At dinner, we get to know each other even better (beyond all the talking we did during the day hike) and listen to some music on my x-mini while playing the Monopoly card game that Laura brought. Brilliant! We call it a night at about 8 pm. I never go to bed this early, but I’m tired, and so are they. There’s the 6:30 am knock on the door indicating our hot water is ready and that we should prepare for breakfast. After breakfast, we depart in our usual manner; pole pole. After about an hour of walking, the scenery changes to something completely different. Now, there are no trees; only a variety of bushes in a gradient of greens and browns. Today, our goal is clearly visible. 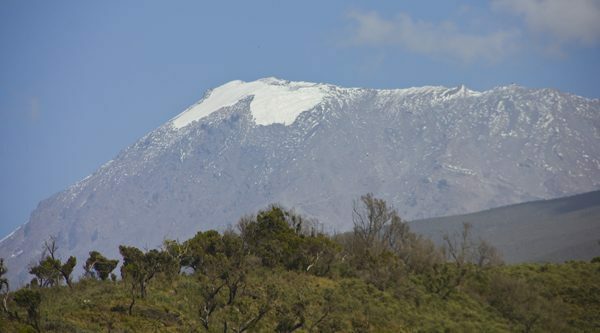 The top of Mount Kilimanjaro waits for us at the end of the trail. I can see it so close, yet I know it so far still. Today I’m dressed with one more layer than yesterday. I can’t feel the altitude through the typical altitude sickness, but I can feel it through the temperature change. The day proceeds for the most part like the day before. Talk and walk, though a bit less of talking to save our breath and energy. The hike during these past two days has not been challenging or strenuous at all. It is just a consistent tiring pace that goes for hours and hours, on a gently sloped uphill. Now, the one thing I feared before the hike makes its appearance. The knee I injured a year ago in Honduras is calling my attention. The bending of my right knee sends this energy through my nerves that makes each stepping painful – more than the last. I try to dissimulate the pain by limping the least possible, but trained eyes cannot be fooled that easy. Issa, our main guide, comes to me and discretely asks me if I’m fine. He looks at me with an “are you sure?” look. He’s unconvinced, but lets it go. After dinner, no games or music. Our tiredness is accumulating, and we still have a long journey ahead of us. While I walk back to my hut, I can see far in the distance the noiseless thunderstorm that is covering Moshi. We are above those clouds by now, so I enjoy watching it rather than worry. Before heading to bed, I load on painkillers and pray to God that my knee will not be the reason I’m not making it to the top. Now I just have to wait and see… and rest. You can read the second part of the story, here. I have goosebumps…what an accomplishment!!! This sounds like an amazing experience! How many hours did you walk each day? And why didn’t you want to tell the guide about your knee, do you think he wouldn’t have agreed that you continued on the trek? I enjoyed reading about your adventure and i liked your pictures. What an accomplishment! The story and photos are beautiful – I can’t wait to get back on the trails myself. Thank you for sharing your experience! Thanks, Brittany! I can’t wait to experience it again either!